Stomata allows gaseous exchange between the plant and the atmosphere. It allows in carbon dioxide and oxygen for photosynthesis and respiration respectively. Carbon dioxide produced during respiration can also escape through these pores; similarly, oxygen produced during photosynthesis also escape. Water vapour always leaves through the stomata. Usually, stomata will shut during the night, to control water loss. Since they are not able to photosynthesise, there is no point in allowing carbon dioxide in. For the question attached, the keyword is "night". There is no photosynthesis and oxygen is not being produced. (2) and (3) are wrong. (4) is wrong as well, since carbon dioxide isn’t being used. 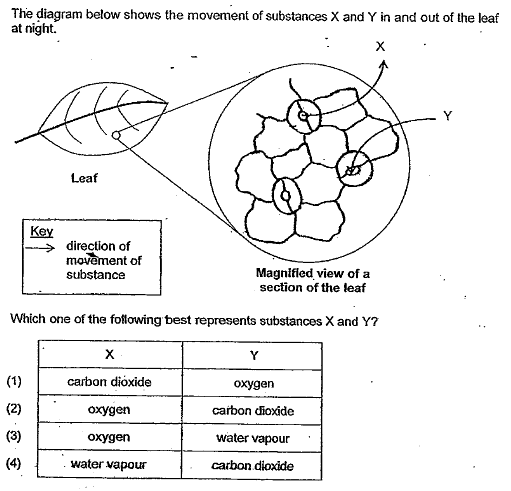 Answer is (1), as the plant uses oxygen and releases carbon dioxide for respiration. This entry was posted in Science and tagged Respiratory system. Bookmark the permalink.